I do loveee sushi, even I can't say that I'm the addicted one. For sushi that is not full cooked I like it too, but I'm kind of picky when it comes to raw sushis. I used to like to came to the same most famous sushi restaurant every time I have an appointment eating sushi together with my friends, which I always getting many story for listeninda after that. Until I known that restaurant have no halal certified, I stopped eating in that sushi restaurant. It was hard indeed... so I started looking for a halal certified sushi restaurant. But it was not really met my expectation and it turn out that I don't really like it. The sushis going messy when bitten. It feels like I just eating plain rice with raw fish. Ewww. A good friend of mine in the office suggested an instagram account who sells homemade halal sushi. Because she wanted to eat sushi with me and I've no longer being her eating sushi partner when she insisted to go to that hits sushi restaurant. I see the catalog and asking the owner via the line, it is also not expensive pricelist at all. I like to give a try because there are so many menu that use cream cheese - well I'm crazy about cheese FYI. All the sushi menu in Kotakuhikari is well cooked, so there is no fresh raw fish when I making order that time. I don't know maybe they added it to the catalog or what. 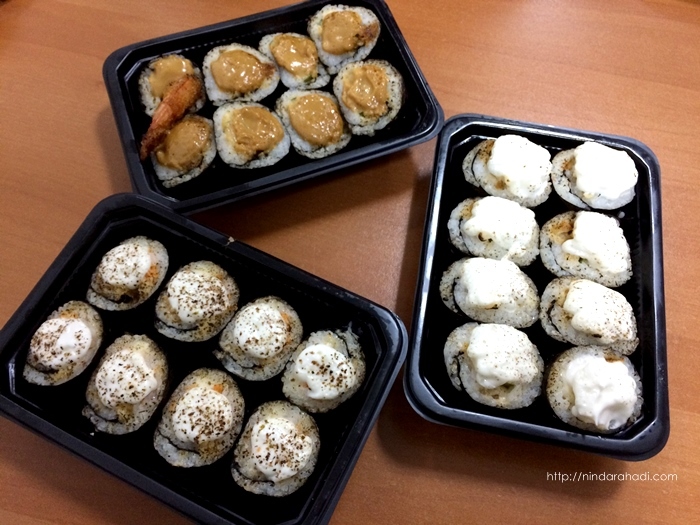 This homemade sushi not yet open the offline store, so the shipping costs quite pricey. It's about 50.000 to my office. In the first purchase we tried 3 menu. Fast delivery, we're impressed. 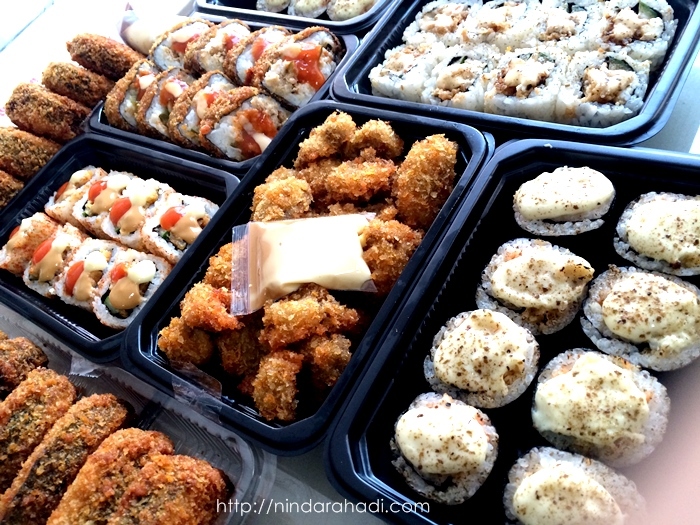 Even before lunch hour our sushi all very ready to eat, so we can eat for lunch right away. The roll is bigger than expected. Sorry, forget the name of the menu but the two menus with white cream topping that really use cream cheese OMG... Solid sushi roll, not stingy and much melted cream cheese. Taste? It's taste soooo good! She's really prove it in my next order. Wowww! In our next order, it was the moment before weekend, so there is some that we ate together at the office and there are some who brought home. I do plan for tomorrow weekend, that I'm not going everywhere so it's will be better when I've already have some stock of food to eat a whole day. Tadaaaaaa! Here is our order. 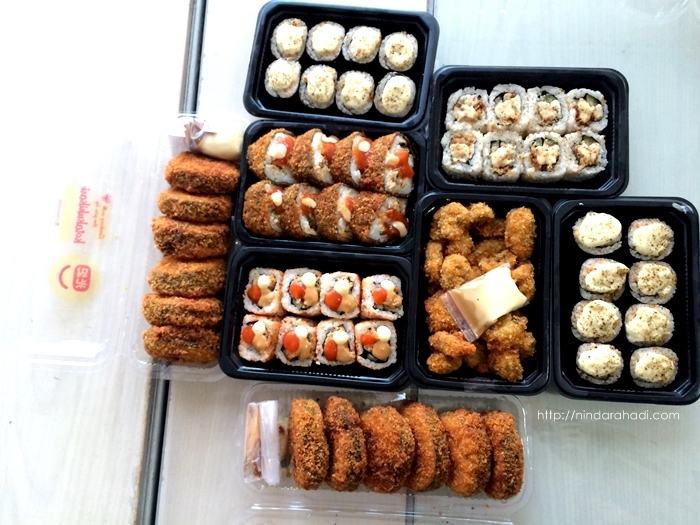 Because we both love cheese so yes almost all the order is with cheese except the fried mushrooms one. Taste... as always, finger licking good :) Everything is delicious.